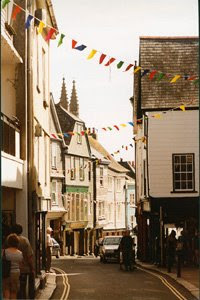 Totnes Carnival Week kicks off Monday 15th August, with a week crammed full of events for all ages. Toyday will of course be taking part in the Odd Object Competition, which runs from 13th - 27th August, so come up to the shop and try and spot our odd object in the window. You can buy a form from paper works or tourist information and play along for just £1. There are great prizes and trophies to be won. Baby Show at the Civic Hall 10.30am till 12noon. Register by 10.15am, entry £1. Mile of Pennies in the High Street, 10am till 12noon. Carnival Bumper Bingo, Civic Hall, 7.30pm. Euchre at the King Bill, 7.30pm for 8pm start, Entry £1. Pool Knock Out Competition at the Dartmouth Inn, 7.30pm, £1 entry. Children's Fancy Dress Procession. Register at the Rotherfold at 1.30pm, judging at Borough Park. Skittles Knock Out Competition at the Meadowbrook social club, 7.15pm start, entry £1. Darts Knock Out Competition at the King Bill, 7.30 pm for 8pm start, entry £1. Teddy Bears Picnic. Methodist Church Hall, 2pm till 4pm, entry £1. For children 3 to 7 years with an adult. Bring your favourite teddy. Fishing Competition, Steamer Quay, register at 5pm to 8.30pm, entry £2. Skittles Knock Out Final at Meadowbrook social club, 7.15pm start. Grand Procession, from Follation House to Totnes Plains. Judging at 4.45pm, move off at 6pm. For free entry form call 863714. Entertainment in the Dartmouth Square after by the Energy Samba Band. Pub Quiz, Dartmouth Inn, 8pm start, entry £1.